Rouben Galichian was born in Tabriz, Iran, to a family of immigrant Armenians who had fled Van in 1915 to escape the Genocide, and who arrived in Iran via Armenia, Georgia and France. After attending school in Tehran, Rouben obtained a degree in Engineering from the University of Aston, Birmingham in 1963. Rouben Galichian has written numerous books outlining the history and cartography of the Caucasus. He is also the author of a number of cartographic articles published in various magazines and has lectured extensively in Europe, the USA, Iran and Armenia. For his services to Armenian historical cartography, Rouben was awarded an Honorary Doctorate by the National Academy of Sciences of Armenia in November of 2008. In 2009 he was the recipient of “Vazgen I” cultural achievements medal. He is married and shares his time between London and Yerevan. The above book documents the native Armenian pedigree in Armenia and Nagorno-Karabagh through the centuries. The text is also of interest as it exposes the Republic of Azerbaijan or ROA [known as Arran until May 1918 – distinct from the historical Azerbaijan in Iran’s northwest] falsifications in historical and cultural fields. Galichian has completed another work dedicated to exposing the ROA’s falsifications of history, culture etc. The book draft is in Armenian but is to be transated into English. The work shall be entitled along the lines of “Historico-geographical Falsifications of Azerbaijan“. The book has alreayd been translated into Russian. Baku’s claims about the Armenians being newcomers in the Caucasus and claiming 5000 years of historic heritage for Turkic-speakers in the Caucasus. Analysis of 40 maps produced over the 2000 years, with particular reference to Islamic maps. Galichian demonstrates that historical Azerbaijan has always been a province of ancient Iran (Media) and not the present-day Republic of Azerbaijan, which was thus named in May 1918. Kavehfarrokh.com will release more information on this upcoming text as soon as it goes to print. “…for the purpose of breaking Azerbaijan’s historical links with Iran… Soviet authorities falsified documents and re-wrote history books…” (Mehdiyova, 2003, p.280). The policy of re-writing history books and falsifying documents has continued to the present day by the Baku authorities. Despite the historical facts, a number of historical revisionist views are officially taught as “history” at the elementary, secondary and post-secondary levels of the educational system in the Republic of Azarbaijan (Former Arran as opposed to historical Azarbaijan in Iran). 2) Shah Ismail is narrated as the founder of the “Independent kingdom of azarbaijan” which is historically false. Ismail specifically re-asserted the sovereignty of the Iranian state and adopted the Persian title “Shah” instead of “Khan“. 3) The book also falsifies information on living persons. Shahyar, an iranian azarbaijani, is introduced as a “pan-Azarbaijani nationalist” when in fact the same Shahyar has written several verses praising Iran. History books are now being published for mass distribution at the international level. The textbook, “A Short History of Azerbaijan”, written by Yagub Mahmudlu and printed by the embassy of the Republic of Azarbaijan in Pakistan, is one such example. The book “A Short History of Azerbaijan” by Yagub Mahmudlu of Baku has essentially engaged in the rehabilitation of former Communist and pan-Turkist propaganda. The book contains a large number of historical distortions and falsified maps. The Mahmudlu book pretends that neither Iranian Azarbaijan nor Arran (modern Republic of Azarbaijan) were ever a part of Iran in history. The historical claims in the book are surprising due to their fantastically revisionist claims. Almost every single point in this book is either falsified or distorted. “…the myth [of a North versus South Azarbaiajn ] became deeply ingrained in the population [of the Republic of Azarbaijan] and was adopted by the PFA [Popular Front of Azerbaijan] as part of the rhetoric.” Mehdiyova, 2003, p.280). A historically false map of an alleged “Greater Azarbaijan” during the Arab Caliphate. Historically all contemporary sources clearly distinguish between the real-historical Azarbaijan which is cited as being south of the Araxes River in northwest Iran versus Arran or Albania located to the north of the Araxes River. There are no maps or references that cite ancient Arran in the Caucasus aboves the Araxes River as “Azarbaijan”. “…the myth [of a North versus South Azerbaijan] was invented under the Soviets for the purpose of breaking Azerbaijan’s historical links with Iran…. (Mehdiyova, 2003, p.280). Shireen T. Hunter (see 1994, p.11) had earlier raised the alarm that the myth of a “divided Greater Azarbaijan” between Czarist Russia and Qajar Iran after the Golestan (1826) and Turkmenchai (1828) treaties had become a major mainstay of the newly independent Republic of Azarbaijan (following the collapse of the Soviet Union by the early 1990s). “…boasts a well-established official national identity …there has been little historical basis for national identity formation among Azeri elites, who were significantly affected by Russification …”. “…If we look back to the history it will be very difficult to find the term “Azeri nation”. Historians have begun to use this term only during Soviet Union period”. You can corroborate this at: Dadasov, Nazim, “What is Azeri Nation”, March 26, 2008, posted on-line at International Research Club website (click here). Dadasov however is very biased. He explains the Soviet policy as having been in place to separate Arran-Albania from Turkey- he makes no mention that Arran was Iranian territory until relatively recently in the early 19th century. Once again, readers may be surprised to learn that a significant number of the modern-day inhabitants of Arran-Albania are unaware of their nation’s links with Iran. “In fact, the very name “Azerbaijani” was not widely used until the 1930s; before that Azerbaijani intellectuals were unsure whether they should call themselves Caucasian Turks, Muslims, Tatars, or something else” [Kaufman, 2001, p. 56]. Historical archives completely contradict what is essence post-Soviet (and pan-Turkist inspired) ethno-nationalist propaganda (and maps). 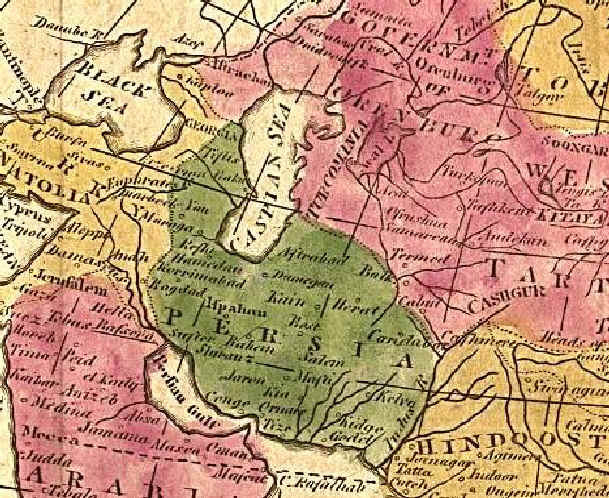 Note a European map of 1805 below, just before the wars in which Russia conquered Iran’s Caucasian territories – note that there is no such entity as a “Azarbaijan kingdom” or “Greater Azarbaijan”. In fact all of modern day Republic of Azarbaijan were simply khanates which were part of the Iranian state. Map of Iran in 1805 before the invasions of Czarist Russia. Note the Caucasus, north of Iran and along the eastern Caspian littoral, which was Iranian territory. There was no “Greater Azarbaijan” supposedly “divided” between Iran and Russia. Russia invaded Iran and forced her to cede the Caucasus. Iran also lost important eastern territories such as Herat, which broke away with British support, Picture source from CAIS. The number of historical distortions on this subject has become so large that debunking these would require volumes of textbooks. On the other hand these falsifications are easy to dismiss with just a few sources. As we have already noted, no such “Southern” and “Northern” Azarbaijan entities are reported by native Caucasian sources, or European (i.e. Russian and British) sources. It is a sad fact that Elchibey went to his grave believing the historical fabrications of the Soviet Communist state, not to mention the falsifications made by the Tsars and pan-Turk activists. But what of the post-Elchibey era today? This is a more complex question as “officially” Baku and Tehran are on cordial terms. But one must look at the large picture as Baku is a close ally of Tel Aviv and Western lobbies – a vast topic which we need to discuss in a separate question. A map drawn by Ibn Hawqal (ابن حوقل) during the Arab caliphates which shows the clear distinction between Arran (north east Caucasus just above Araxes), Armenia (north/northwest Caucasus just above Araxes River) and Azarbaijan inside Iran and below the Araxes River. Ibn-Hawqal:clearly cited the Araxes River as the southern limit of Arran. ابن حوقل نیز طبق نقشه ای که از سه سرزمین ارمنستان، آذربایجان و اران ارائه کرده است ، رود ارس را مرز میان آذربایجان و اران دانسته و هنگام بحث از شهرهای اران ، از بردعه ، جنزه ( گنجه ) شمکور ( شامخور ) ، تفلیس ، برزنج ، شماخیه ( شماخی ) ، شروان ، شاوران ، قبله و شکی ، نام برده ، اما شهرهای اردبیل ، دَه خرقان (دهخوارقان) ، تبریز ، سلماس ، خوی ، برکری ، ارمیه ( ارومیه ) ، مراغه ، اشنه ( آشنویه ) ، میانج ( میانه ) ، مرند و برزند را جزو شهرهای آذربایجان دانسته است . The Hodud-ol-Alam Text (10th century AD): Cites the Araxes River as the northern limit of Azerbaijan. Al-Muqaddasi (10th Century AD): Divided Persia into eight regions which include both Azerbaijan and Arran. Defines Arran as being situated between the Caspian Sea and the Araxes River. «اران نامی است ایرانی، دارای سرزمینی فراخ و شهرهای بسیار که یکی از آنها جنزه (گنجه) است و این همان است که مردم آن را گنجه گویند . میان آذربایجان و اران رودی است که آن را ارس گویند . آنچه در شمال و مغرب این رود نهاده است از اران و آنچه در سوی جنوب قرار گرفته است ، از آذربایجان است . Borhan-e-Qate (فرهنگ برهان قاطع) (Completed 1602 or 1632 AD – during the safavid era): Aras (Araxes) defined as a river flowing past Tbilisi in Georgia and forming the boundary between Arran and Azerbaijan. « ارس ـ به فتح اول و ثانی و سکون سین بی نقطه نام رودخانه ای است مشهور که از کنار تفلیس و مابین آذربایجان و ارّان می گذرد . Hamdollah Mostofi (حمداله مستوفی): makes a clear distinction between Arran and azarbaijan being divided by the Araxes River. حمداله مستوفی نیز در کتاب مشهور نزهه القلوب ، از شهرهای آذربایجان یک به یک نام برده و میان دو رود ارس و کُرا اران و آن سوی رود کُر را شیروان می نامد .Abu al-Fadai Dameshqi (ابوالفدائ دمشقی): makes a clear distinction between Arran and azarbaijan being divided by the Araxes River. The same distinction in antiquity and pre-Islamic times is seen between Azarbaijan (in Iran) below the Araxes River versus Arran (in the Caucasus above the Araxes River with Strabo (64/63 BC-23 AD) who noted that the people of Iranian Azerbaijan (known as Media Atropatene at the time of Strabo) as Iranians with Persian as their language (Strabo, Geographica, see p. 17-18). Another example is Arrian (92-c. 175 AD) who noted that the region north of the Araxes River is cited as “Albania” and south of the Araxes as “Media Atropatene”. Sassanian emperor, Shapur I (r. 241-270 AD), cited Albania and Media Atropatene as two separate provinces of the Persian Empire. Professor Mark Whittow’s map of Oxford University clearly shows the historically attested distinction between ancient Arran/Albania and the original Azarbaijan in Iran. 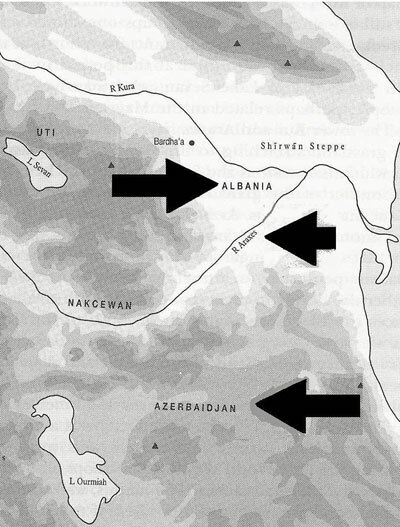 Note how the Araxes River separates Arran from the historical Azerbaijan (in Iran). Suffice it to say that there has been no entity known as a “Greater Azarbaijan” either before or after the Islamic era. Ottoman Map showing Iran in the Middle Ages (note that the map specifically states “Iran” in perso-Arabic script). The map also confirms that much of the Caucasus was Iranian territory and that Azarbaijan province in Iran is distinct from those Caucasian khanates (north of the Araxes), re-named in 1918 as “Republic of Azerbaijan”. Note that the Caucasian khanates (notably those areas now known as “Republic of Azarbaijan”) were part of Iran’s domains. The map (like all historical maps) makes clear that the so-called “Greater Azarbaijan state” (first promoted by the Soviets and now by Baku and its Western supporters) has never existed in history. The 2nd International Conference on the Talishi Studies shall be held at Yerevan, Armenia on 12-13 Nov., 2011. The Conference is organized by the International Journal “Iran and the Caucasus” (BRILL, Leiden-Boston) in the Framework of the Celebration of its 15-th Anniversary, in cooperation with Modus Vivendi Center, Yerevan; Caucasian Centre for Iranian Studies, Yerevan; International Society for the Study of Turkey, Iran and the Caucasus (ISSTIC), and ARMACAD (supported by Hyksos Foundation). Talishi Studies: Present State and Perspectives. Dr. Prof. Ali Granmayeh (United Kingdom), London Middle East Institute, SOAS, University of London-Talishi Language and Culture: How to Save them? Dr. Prof. Kaveh Farrokh (Canada), University of British Columbia-The Process of the De-Iranianization of Caucasian Azerbaijan (1828-Present). Dr. Vardan Voskanian (Armenia), Iranian Studies Dept, Yerevan State University-New Talishi Alphabet based on the Avestan Script (Project Presentation). PRESENTATION – The new monograph by the Iranian Studies Department, Yerevan State University “Introduction into the History and Culture of the Talishi People”(in Russian) (ed. by Garnik Asatrian, Yerevan, 2011). Irina Natchkhebia and Gia Jorjoliani (Georgia) – Путешествие в Талыш Джеймса-Бэйли Фрезера в 1822 (James Baillie Fraser’s Travel in Talish in 1822). Frontal view of the State University of Yerevan, host to the 2nd International Conference on the Talishi Studies on 12-13 Nov., 2011. The university is host to an excellent Iranian Studies program, staffed by exemplary researchers such as Professor Garnik S. Asatrian (Chair, Iranian Studies Dept., Yerevan State University; Editor, “Iran and the Caucasus”, BRILL, Leiden-Boston) and Professor Victoria Arakelova (Associate Professor, Department of Iranian Studies, Yerevan State University; Associate Editor, “Iran and the Caucasus”, BRILL, Leiden). The conference of Nov.12-13 has been possible through the works of Professors Asatrian and Arakelova. Mahmoud Ja’afari-Joneidi (Iran) – Landscape and Dialects in Talesh. Mostafa Farzpourmachiani (Iran) – Common features of Tati, Talishi and Gilani. Sekandar Amanolahi (Iran) – The Taleshis’ Ecological Adaptation and its Significance in Comprehending the Origin of Pastoral Nomadism in Iran. Victoria Arakelova (Armenia) – Demonic creatures and demonized deities in the system of Talishi Folk beliefs. Samvel Markarian (Armenia) – From the Medieval History of the Talishi People. FAREWELL DINNER -19.30- University Guest House, Mashtots Ave. 52. This topic examines the process of de-Iranization in those regions of the Caucasus corresponding to the modern-day Republic of Azerbaijan from 1826 to the present. This process can be broken down into four phases. The first phase (1826-1917) took place during the Czarist Era when Russian authorities sponsored and promoted Turkic cultural developments in the endeavor to diminish the region’s ancient Iranian influence. A prime example of Russian policies was the promotion of the Akinci plays followed by the Akinci newspaper (with Zardabi as editor) which was stridently anti-Persian. In tandem with Russian policies, the rise of Pan-Turkism in the Caucasus (1850s-1917) also promoted the process of de-Iranization in the Transcaucasus. By the early 20th century a number of pan-Turkist and anti-Persian writers with ties to the Young Turks of the Ottoman Empire (i.e. Ali Husseinzade) had risen to prominence. By this time Russian authorities were also sponsoring the anti-Persian Mullah Nassreddin magazine. The second phase of de-Iranization occurred with the arrival of the Musavat Regime in Baku and the application of the term “Azerbaijan” (until 1918 only geographically recognized as the Iranian province of that name below the Araxes river) (1918-1920) during which pan-Turkism and de-Iranization were ideologically rationalized for the first time in Pan-Azeri terms (the union of Iranian and Caucasian Azerbaijan). The third phase of de-Iranization occurred after the fall of the Musavat s to the Soviet Union; during the latter’s tenure, a determined process of de-Iranization was implemented from the 1930s to 1990. As noted by Mehdiyova “…Soviet authorities falsified documents and re-wrote history books”. The final (fourth) phase followed the rise of the independent Republic of Azerbaijan (ROA) in the aftermath of the collapse of the Soviet Union. The de-Iranization policies implemented in 1826-1990 continue to be promoted at the educational and cultural levels by ROA authorities. The article below was first published on the Musings of the Masis: Posts of my observations from Byzantine, Persian and Armenian History website on April 10, 2011. Kindly note that the version below is different from its original posting as it contains comments by Hamid reza Zohoorian and Kaveh Farrokh, as well as a Drafshe Kaviani drawing by Kaveh Farrokh. The photo inserts below are also drawn from Kaveh Farrokh’’s lectures at the University of British Columbia’s Continuing Studies Division and Stanford University’s WAIS 2006 Critical World Problems Conference Presentations on July 30-31, 2006). Kindly note that the new course unveiled during the Summer Semester at the University of British Columbia-Continuing Studies Division entitled `Persia’s Silent Legacy in Christianity & European Culture` is being offered again this semester beginning on Tuesday November 15, 2011 (evening commencing at 7:30 pm). The course will be offered on the Robson Square campus (downtown Vancouver) of the University of British Columbia. COMMENT BY Kaveh Farrokh: The term Nshan is identical to the Persian term “Neshan” which means seal or emblem. [CLICK TO ENLARGE] Photo taken in November 2010, at the Surp Nshan Basilica, Republic of Armenia. NOTE COMMENT BY Hamid Reza Zohoorian (originally in Persian): The person standing to the right of the emblem is dressed exactly in the style of Sassanian era nobility – a style specifically seen from the time of Khosrow I Anoushiravan (r. 531-579); note that the stance and gaze of the person is again exactly in the style depicted in Sassanian arts. For further analysis see image comparisons below. Outside in the courtyard are some ruins, one of which caught my eye. It had a Cross inside a circle, and itself looked like a banner used in battle as it was upon a pole. At either side was a person, eroded away, yet still visible. A more clear drawing of the cross in the standard on the stone. PHOTO INSERTS & DESCRIPTIONS BY Kaveh Farrokh: ((a) Surp Neshan Basilica (4th Century AD) near Abaran in Republic of Armenia (b) Pagan Celtic Cross (Irish) (c) Medieval Crusader Cross of the Teutonic Knights (d) German Iron Cross circa World War One. A motif on the upper sleeve on the tunic worn by King Darius I from the Stele at Persepolis (circa 500 BC). I also saw two coins minted by the Satrapy of Caria around 395 BC and 344 BC, and drew the motifs on their Reverse sides. I then learned about the “Pazyryk” carpet from a tomb in the Altai mountains, that is dated to around 400 BC, originating from Achaemenid Iran. It bears many examples of the “Drafsh” motif. Motif on the Pazyryk carpet found in the Pazyryk valley in the Altai Mountains. This carpet is believed to have originated in Iran circa 400-500 BC. 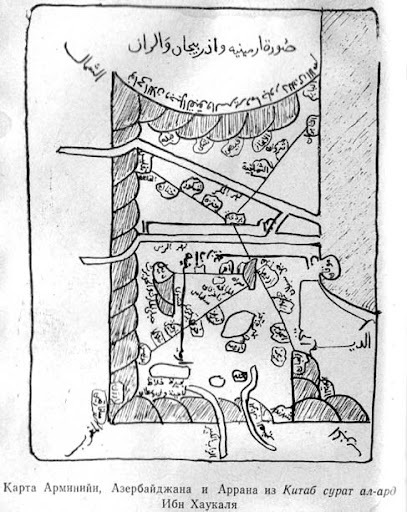 NOTE COMMENT BY Kaveh Farrokh: The Pazyryk carpet displays the first depiction of the Drafsh-e-Kaviani. The Pazyryk region was settled by North Iranic Scythian peoples. It is possible that the Parthians, who were of Scythian stock, introduced this ancient Iranic theme as Iran`s major national standard. I also began to read about the Sassanian era, and the “Drafsh” of Kaveh, perfectly depicted on the reverse of this coin from around 100 BC of the ruler of Persis, Artaxerxes. (Left) Artaxerxes, king of Persia (Right) Artaxerxes offerring prayers in a temple. Note that the Drafsh of kaveh is on the right-hand side. NOTE COMMENT BY Kaveh Farrokh: The actual origins of the form of the Drafsh-e-Kaviani may be traced to the Achaemenid era, to the aforementioned Pazyryk carpet. There are four petals facing northwest, northeast, southwest and southeast with fixtures at north, south, east and west. A reconstruction of the Sassanian Royal Standard, the Drafsh-e-Kaviani (Farrokh, 2005, pp.22). There were apparently a number of versions of these, however the major national banner measured roughly 16 by 20 feet and was studded with gold, silver and jewels. This was captured by Arabo-Islamic forces after the Battle of Qaddisiyah in 637 AD. Note that the above version also displays the eagle which was seen among the royal standards of the Achaemenids, centuries before the Sassanians. The eagle symbol was viewed as a benevolent protector and sign of good heavenly fortune. Harper (1978, pp.84) has noted that Sassanian warriors often adorned their weapons with the feather decoration of the bird-god Varanga. The Star motif was also used by the dynasty that ruled Pontus from 302 – 37 BC, among whom were king Mithridates VI. His ally and son-in-law was king Tigran II of Armenia, and below is my illustration of the motif used on his crown. A Tetradrachm of King Tigran II. His crown bears the Star motif. Reading Dr. Kaveh Farrokh’s book “Shadows In The Desert”-سایه‌های صحرا؛ ایران باستان در جنگ– Персы: Армия великих царей-I saw a photo of what is called the “Cup of Khosrow” and I noticed the “Drafsh” motifs which decorated it. I drew an example of one of them. One of the fifty-four “Drafsh” motifs displayed on the “Cup of Khostow” circa 579 AD. On further reading of “Shadows In The Desert”-سایه‌های صحرا؛ ایران باستان در جنگ– Персы: Армия великих царей– I saw a photo of a fresco from the palace of an Ummayad Caliph, near ancient Palmyra. Called the “Qasr Al-Heir El Gharbi” the paintings have a border of “Drafsh” running around them. Below is my drawing of one of them. ”Drafsh” motif on a fresco from an 8th century AD palace of Qasr al-Heir el-Gharbi , at Palmyra, Syria. On further reading I learnt that the “winged emblem of Zoroaster” had been in use before by the Assyrians. Below is my drawing of a star motif on a stele from the reign of king Ashurbanipal II, circa 850 BC. Winged Sun-Disc on a motif of king Ashurbanipal II, from the city of Nimrud circa 850 BC (Mosul Museum, Iraq). This Star motif went back further, I saw a photo of a boundary stone from the reign of king Meli-Shipak II of Babylon, circa 1186 BC which had the star on it. My drawing of the star upon the boundary stone. What can be surmised is that this star motif had a deep meaning in the successive dynasties of Mesopotamia, what it’s exact representation is though, is another question.